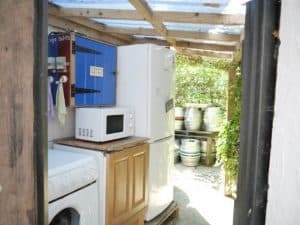 Alde Garden: Like camping…But with a real kitchen! 2 tables, lots of chairs. Pretty much everything you could possibly need to cook with; we’ve got you covered – all you need to bring is the food! All of these items are available at all times for all guests, no extra charge! Yes, it’s camping but you’re not restricted to cooking on a campfire. So if you fancy whipping up something delicious in the kitchen; please be our guest! For ingredients, though, your first port of call should be to our honesty shop, also located in the shelter. 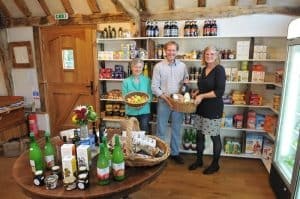 Here we have compiled all the essestials that you could need for your stay with us, as well as showing off some of our favourite local produce. 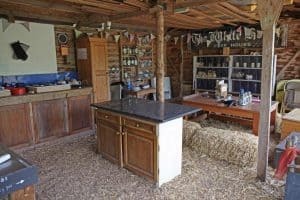 Here you will find eggs from our hens & ducks (when they’re laying), pasta, pesto, tinned local baked beans & dhal, plus a essentials such as bamboo toothbrushes and natural deodorant. We also have a freezer by the house stocked with local bacon, sausages, milk & butter. You can also store your own food in there or the fridge. Just make sure it’s clearly labelled with your full name to avoid it being eaten by the fridge pixies! We also have raised herb beds dotted around the site which you are welcome to use to add some extra flavour to your meals. 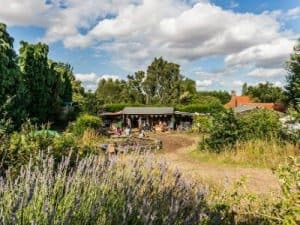 Just a short walk from the campsite is the wonderful Juniper Barn, a Café/Shop packed with tasty local treats. You can pop in there to top up or, why not order a breakfast hamper to be delivered – it really does take all the hassle out of mealtimes!